French 1948 Delahaye 135 M Cabriolet Restored For Concours de'Elegance! - Muscle Cars Zone! French 1948 Delahaye 135 M Cabriolet Restored For Concours de’Elegance! It seems that we live in a time where if you come across an old classic car, you are the luckiest person alive hence they are extremely rare and difficult to find. People look for them at the most unusual places and spend weeks, months and sometimes years to find what they are looking for. In this video we check out such barn find that could easily be one of the best finds in these recent years. We will be looking into the original condition and the restoration process of the French pride, the 1948 Delahaye 135 M Cabriolet Faget – Varnet. 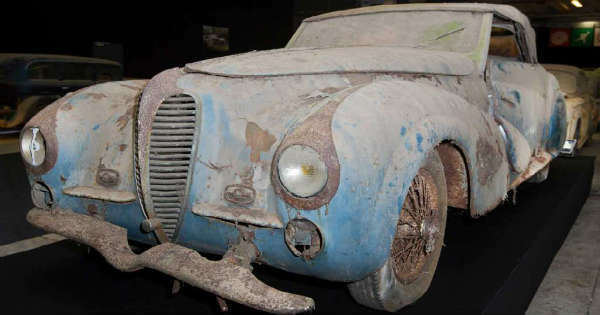 This awesome car was found in a French barn that was owned by the collector Roger Baillon and it has been sitting there for years and years until it was discovered! But what makes this car so extraordinary? Well, only six such cars have survived over the years and this is the third one that is known. This amazing barn find after the restoration process appeared on the Concours de`Elegance at Pebble Beach and was later bought by Disiere back in February 2016 at an auction held in the French auction house by the name of Artcurial Motocars. At the barn owned by Roger there were 60 other classic cars as it can be seen from the photos in this compilation. The car underwent a restoration process by Stone Barn Automobile Restorations in New Jersey. Check out this awesome video about this Delahaye and decide whether this really is the barn find of the century!